The night began with the continuation of last night's episode and the veto. They showed Paola and Zach calling out Devin. Zach who was a member of the "Bomb Squad" was put up by an alliance member. Paola had made a deal with Devin that if she threw the HOH then he would use the veto on her. He lied and used the veto on Brittany instead. I totally agree with the two of them going off. Zach exposed the "Bomb Squad" and Paola told everyone that Nicole and Hayden knew about the deal. They did know but they had nothing to do with it. Lots of screaming and anarchy. 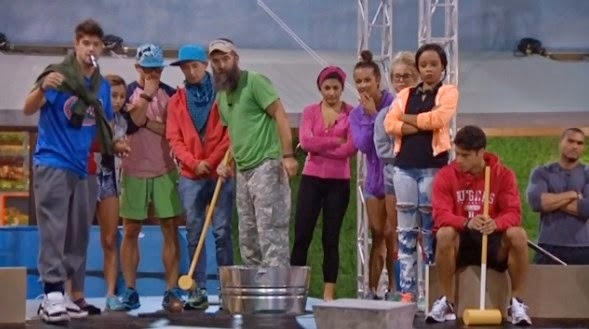 Right after that it was assumed everyone would vote out Zach. The girls FINALLY talked to each other and while they want to keep Paola, they know Devin is Zachs' target and Zack has a better chance at winning HOH than does Paola. They take their chance that Zach has dropped out of the "Bomb Squad" and will help to get Devin and Cody out. Then in no real surprise, a 10-2 vote, Paola was evicted. Donny and Jacosta were the two votes for Paola. Again, not surprising. In the goodbye messages, Zach and Devin were a bit ugly and Donny's message was sweet and made Paola tear up. To the HOH Competition. "Underwater Polo" is what this comp is called. Last night the house guests were given a practice field where they could practice for one hour. Even Devin, the current HOH that can not compete, practiced. Odd. The comp was a ramp sloping down away from the house guests. The house guests had to hit a ball with a croquet mallet to the end. There were several obstacles on the ramp and at the end there were several point slots. The two competitors that hit the ball into the highest point slot became the new Heads of Household. Nicole got the highest score of 29 and Derrick the second highest at 28. Congrats to the 2 new Heads of Household.